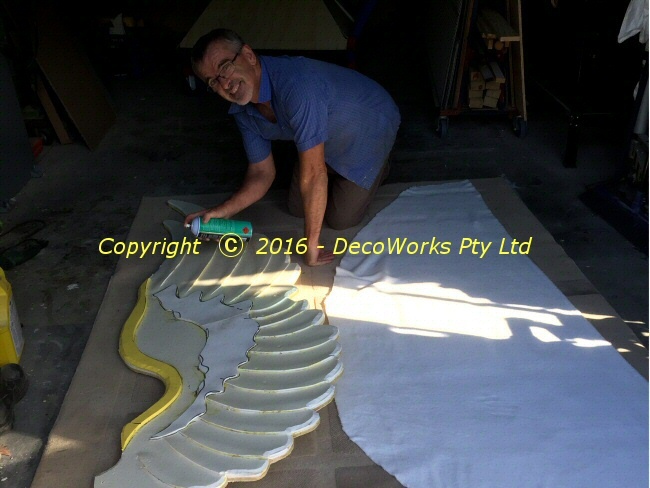 The Wayside Chapel approached DecoWorks to build a giant 3D version of their winged heart company logo to lead their float in the 2016 Gay and Lesbian Mardi Gras held in Sydney. 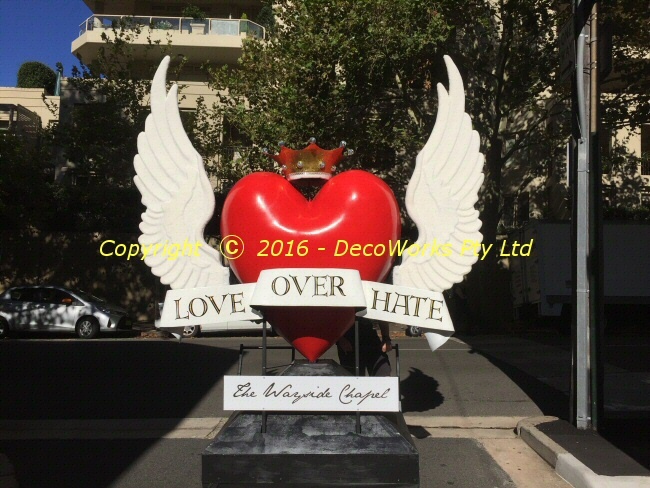 The image of a heart flying up Oxford Street promoting "LOVE OVER HATE" was very appealing and it had been almost twenty years since the last parade contribution so we accepted the project. 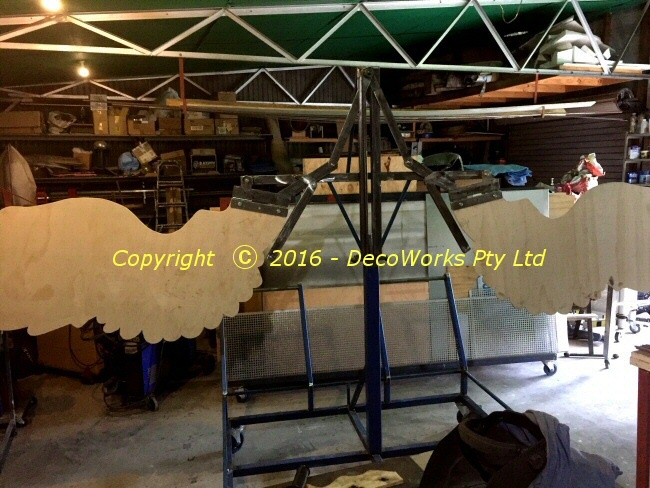 The final design was a pushable trolley with a giant version of the winged heart logo fitted on top. 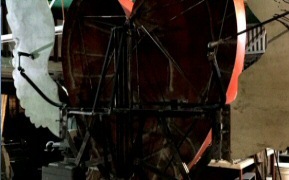 The wings had a mechanism that allowed them to move under the control of a pneumatic cylinder operated by compressed air. After deciding the best operation for the wing mechanism a small 1/6th scale model was built to test the concept. 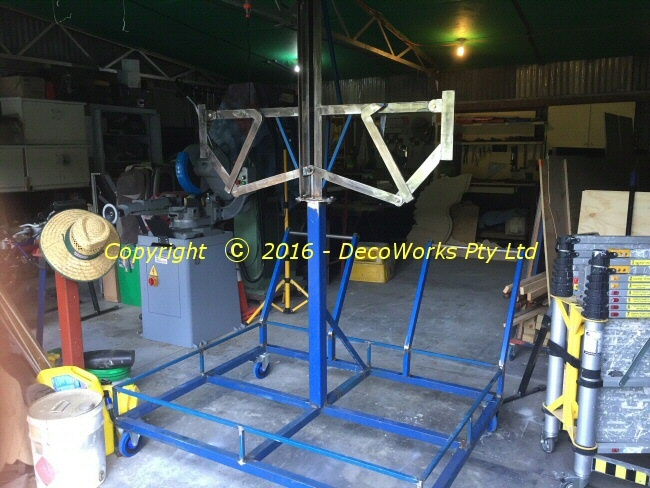 From this the full-size version was built and fitted to a steel trolley frame. It was decided to use pneumatics to operate the wing mechanism due to its simplicity and ease of control. 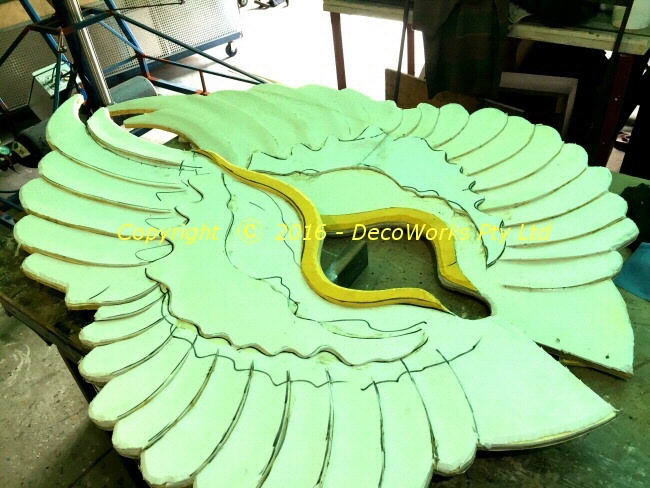 The construction of the wings themselves was such that there was some flexibility along their length for safety. 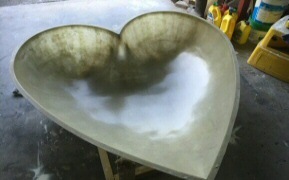 The heart was cast from a fibreglass mould that took two weeks to build. 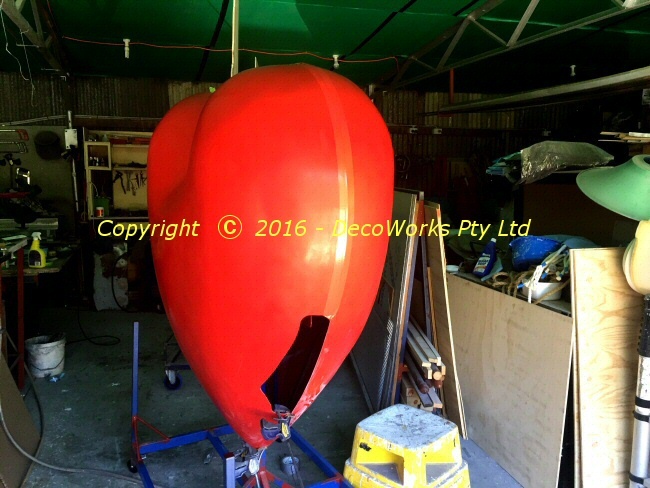 Because of the tight time-frame of just 4 weeks to build the float red pigment was used in the gelcoat when casting the heart to save time by not having to paint it red later. It proved to be a good choice as the finish, after being polished, was far more durable than paint. 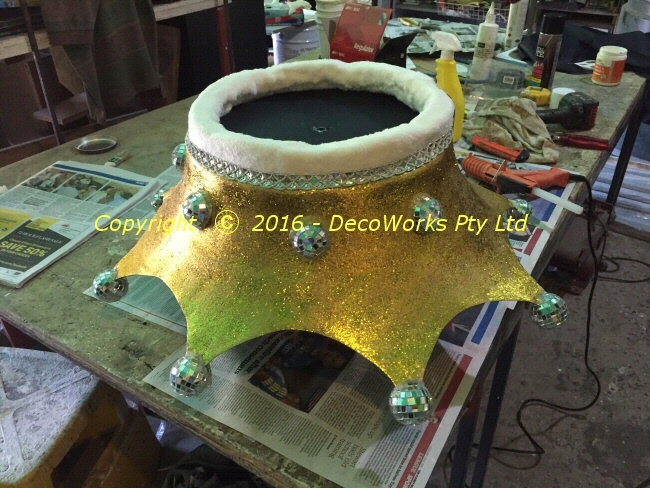 The crown and the front banner were also made from fibreglass and were fitted with steel frames to attach them to the structure. Clicking on the thumbnails below brings up a full-size image. 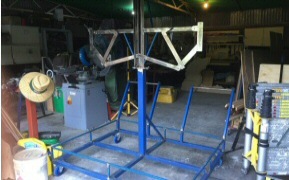 The mechanism to operate the wings bolted onto the base trolley. 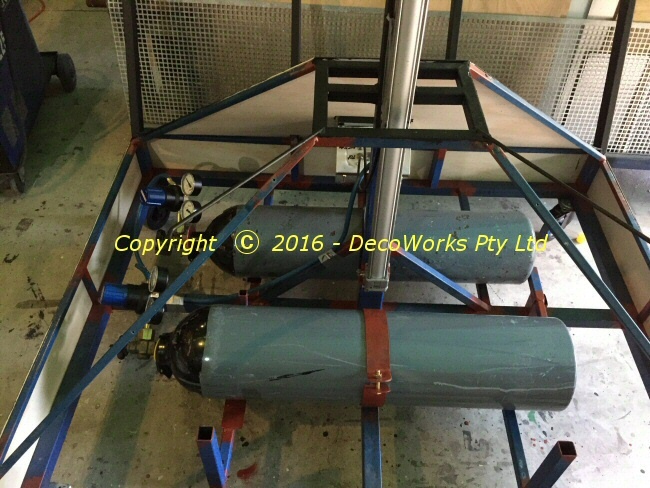 The pneumatic cylinder control valves were mounted in the base section. 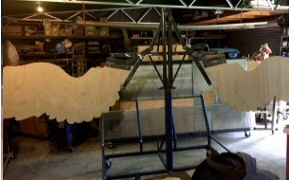 The ply wing sections are fitted to the mechanism. 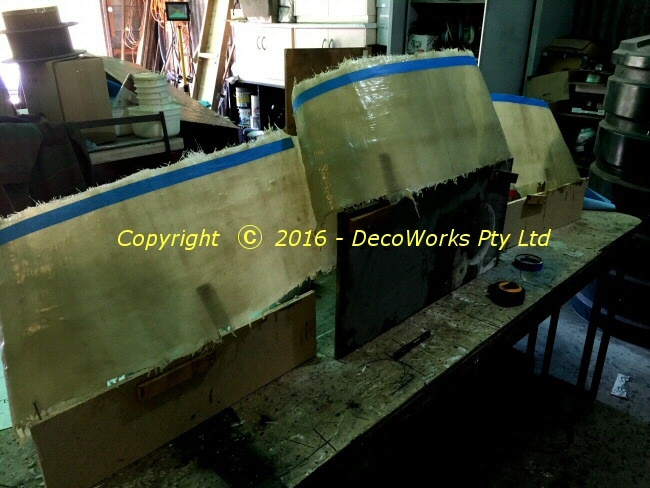 Later these ply sections were covered with closed cell foam and white cotton fleece. 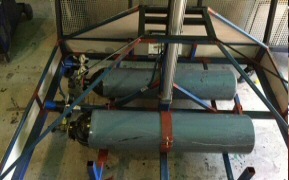 Two *E* size cylinders of compressed air were fitted to the base to operate the pneumatic cylinder. 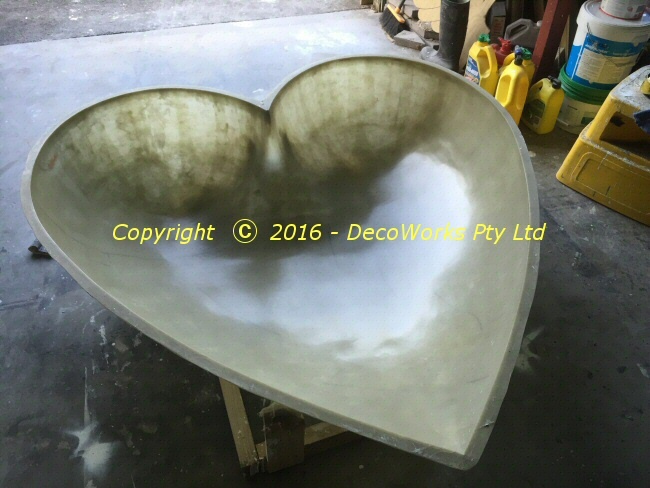 This is the completed fibreglass mould of one half of the heart. Two casts were taken from this mould to make the 3D heart. 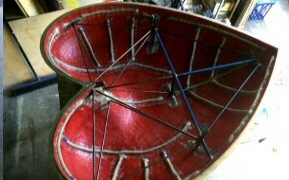 The steel framework fitted inside the front heart shell to support it over the wing mechanism. 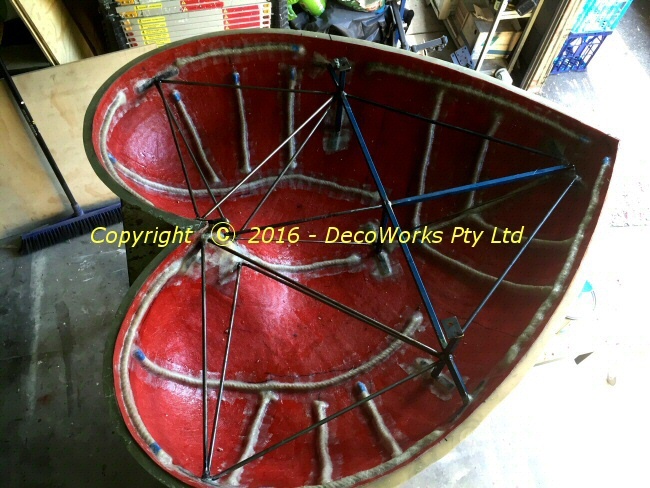 Additional fibreglass bracing was added to ensure strength and rigidity. The front heart shell is hooked onto a sleeve at the top of the wing mechanism and secured in position by two bolts to the main frame. The back heart shell fits onto the front one with a pin on the top of the front shell. Four screws fix the rear shell to the front and the seam is disguised by red cloth tape. 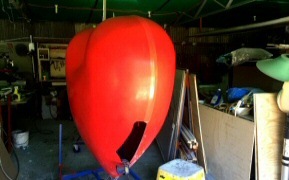 A separate travel frame was required to transport the heart. 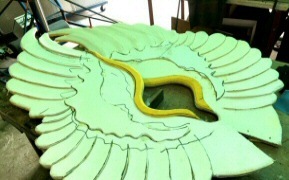 Layers of 5mm foam were glued together and shaped to form the basic shape of the wings. 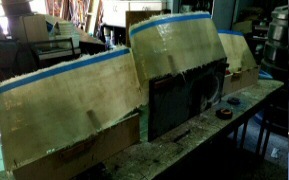 The lower half was ply while the extremities were foam for flexibility. 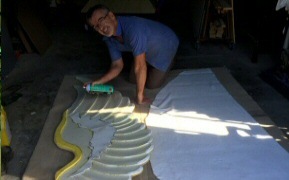 The foam wings were covered in ivory coloured cotton fleece fabric. The shape of the feathers were defined through the fleece giving them a uniform and soft appearance. 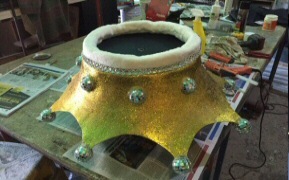 The crown was made from a fibreglass shell covered in gold glitter. 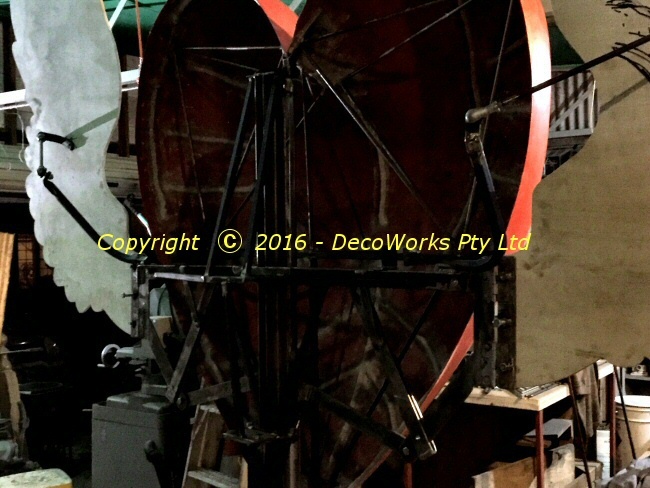 Small 50mm mirror balls were attached to the crown tips and a circular steel frame fitted to the inside supported it on a pin on top of the 3D heart. The front banner was made from fibreglass and trimmed to size. The signage, in the appropriate font, was made in stick-on vinyl lettering. The whole unit, once fitted with a steel brace frame, fitted into the base unit by two steel sleeves. 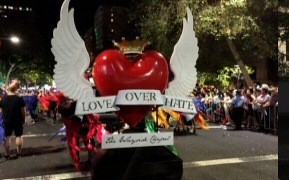 A shot of the winged heart during the Mardi Gras parade. When the pushable was stationary the pneumatics were switched off which returned the wings to their upright rest position. When it started moving again the air was switched back on and the wings automatically oscillated up and down. 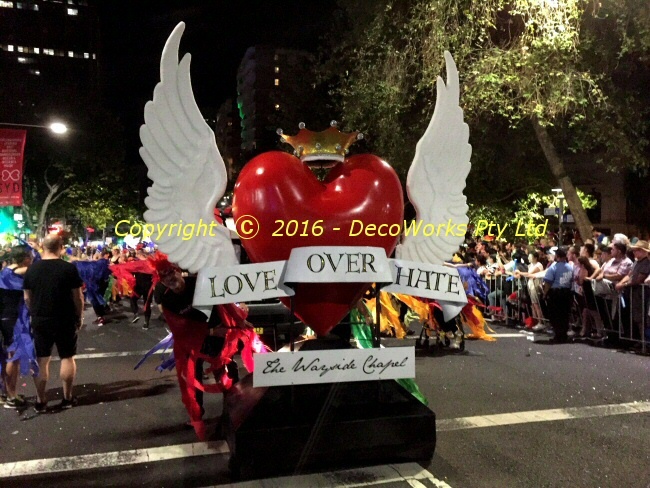 This short Youtube video shows the wing operation during the Mardi Gras parade.